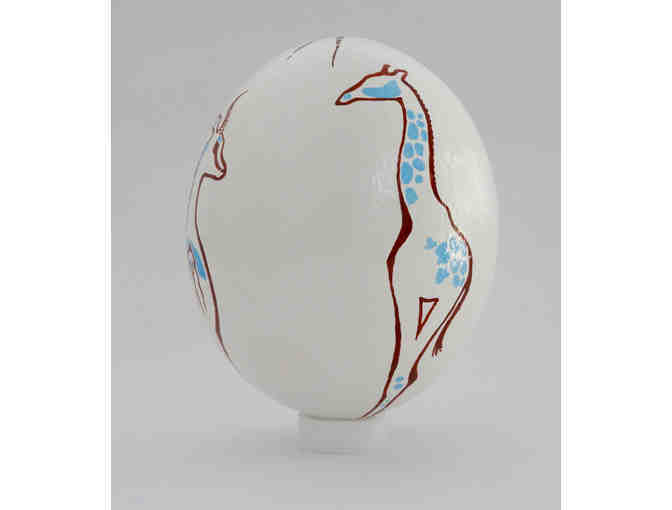 This egg features creatures found in the Kalahari Desert – the ostrich, the cheetah, the giraffe and the springbok; while the top of the egg shows guinea fowl feathers and porcupine quills. 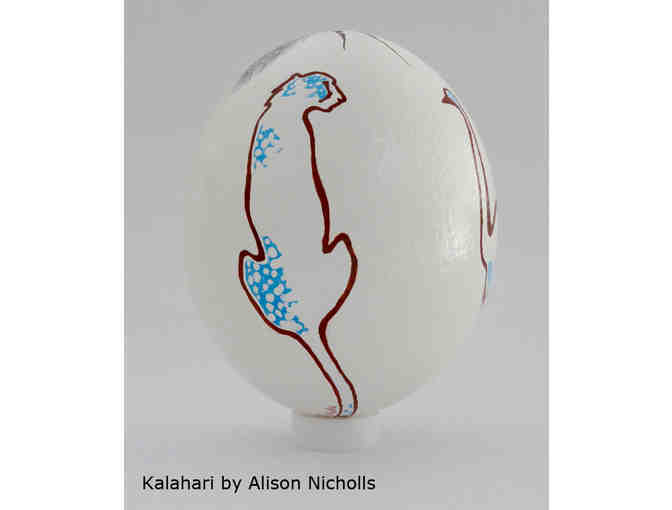 The colors of the egg also represent the colors of the Kalahari. White is for the wide, flat, salt pans. Blue is for the huge, pale pastel skies. Brown is for the thorny scrubby brush and tall grasses. Alison Nicholls is an Artist inspired by Africa. Botswana and Zimbabwe were her home for a number of years and she returns annually to sketch in the bush, lead Art Safaris for Africa Geographic and visit conservation organizations. Alison is a member of Artists For Conservation, the Society of Animal Artists, the Explorers Club, the Salmagundi Club, and Co-president of the Mamaroneck Artists’ Guild. The US Department of State used Alison’s art to promote the Coalition Against Wildlife Trafficking initiative; her art has been widely exhibited, including at the Botswana Mission to the United Nations in Manhattan; she frequently lectures about art, Africa, wildlife and conservation; and recently she published a book of her field sketches and studio paintings from Tanzania. She lives in Port Chester, New York, with her husband, Nigel, and German Shepherd dog, Chase. Your support matters, so Cheetah Conservation Fund would like to use your information to keep in touch about things that may matter to you. If you choose to hear from Cheetah Conservation Fund, we may contact you in the future about our ongoing efforts. Copyright © 2003-2019 Cheetah Conservation Fund and BiddingForGood, Inc. All Rights Reserved. Designated trademarks and brands are the property of their respective owners.